Here's a newly published children's picture book for you to look out for! 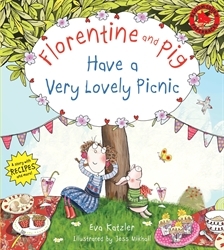 Florentine and Pig Have a Very Lovely Picnic was written by Eva Katzler, illustrated by Jess Mikhail, recipes and crafts by Laura and Jess Tilli, and published by Bloomsbury, 2012. Welcome to the magical world of Florentine and Pig! Join them on their adventures as they discover the glorious world of friendship, frolics & food. Florentine and Pig are going to celebrate a lovely sunny day by having a picnic. Florentine puts on her thinking cap and comes up with a delicious menu, including treats like apple and carrot muffins - only to realise that Pig ate the last of the apples! Pig knows what he has to do when he spots three perfect apples at the top of the tree in the garden. Pig is intrepid and Pig is brave, but how good a climber is he? A near disaster is averted, and Florentine and Pig get to work making a very lovely picnic indeed. Families can join in the cooking fun by following the recipes at the back of the book. Florentine's a sweetie, but Pig stole my heart in this book. He's such an adventurer, it's probably just as well he has an upside-down basin to protect his noggin! I love the way Katzler encourages kids to explore the joy of making things, and of getting messy with it. The inclusion of recipes and a craft at the back of the book means that parents can share the story with their youngster, then follow up with some creative fun. The Florentine and Pig website has stacks of resources to support the book too. Mikhail's illustrations are truly delightful. Kids will love their quirkiness. The colours, patterns, details and borders are a real visual feast, providing so many opportunities for discovery and re-discovery. You can discover more about this children's picture book in this video below. And for even more great reviews, check out the Kid Lit Blog Hop! @JamboI agree, the recipes were a really nice touch! Hi Susan, This does sound like a lovely book and I like how more nutritious snacks for the picnic are emphasized. Those extra elements at the back of the book (recipes and crafts) are definitely a bonus too. What a lovely book title-sold me right there! The extras are a real bonus. I love added extras in books, too. Love it when publishers and authors help extend the reading experience! @RedpefferAgreed! It really is an unusual title but cute too.